Wednesday January 28- 1930 Busy with the work. A letter from Winnie I wrote to Laura and Winnie in A M. Mary came for them I worked on the rug all afternoon and evening Thursday January 29- 1931 Early this morning I got a special delivery letter from Grace McCallister that Jane is very bad I wrote Grace. Later wrote Aunt Emma and sent the letter to her. Mary came for me at noon. 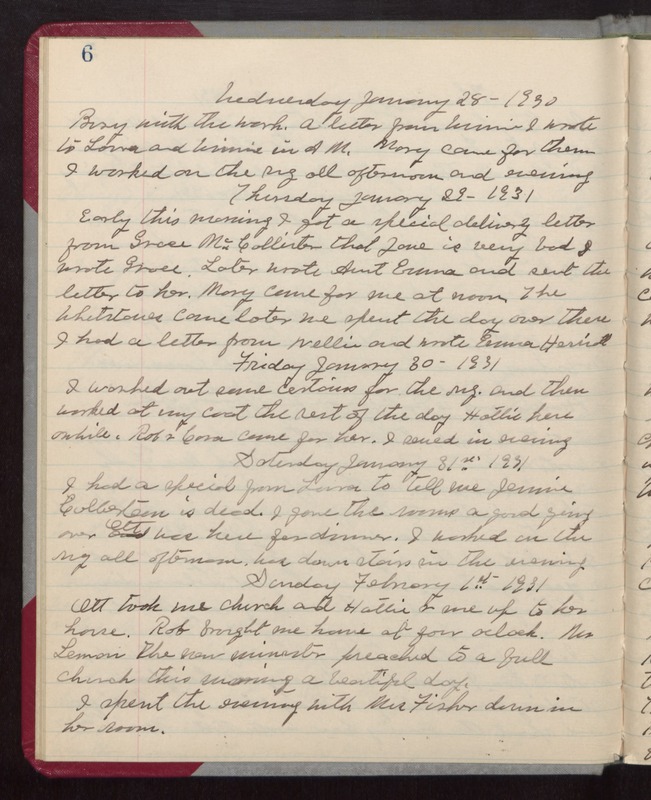 The Whetsones came later we spent the day over there I had a letter from Nellie and wrote Emma Herriott Friday January 30- 1931 I washed out some curtains for the rug. and then worked at my coat the rest of the day Hattie here awhile. Rob & Cora came for her. I sewed in evening Saturday January 31- 1931 I had a special from Laura to tell me Jennie Culbertson is dead. I gave the rooms a good going over Ott was here for dinner. I worked on the rug all afternoon. Was down stairs in the evening. Sunday February 1st 1931 Ott took me church and Hattie & me up to her house. Rob brought me home at four oclock. Mr Lemon the new minister preached to a full church this morning a beautiful day. I spent the evening with Mrs Fisher down in her room.